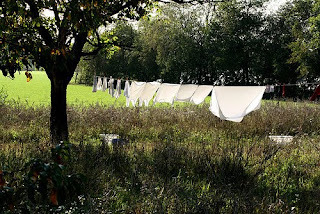 Small changes to our washing regime may reduce our energy use, therefore saving us financially. Additionally, the way we launder our clothes may have a greater impact on our environment, and the longevity of our garments. Consider a laundry wash cycle using cold water instead of hot. The majority of us launder clothes in hot water, but did you know water heating accounts for 90% of the energy consumption of washing machines, and heat used to wash clothes in hot water can generate as much as five times more greenhouse gases than clothes washed in cold water *BCHydro. If we choose to launder in cold over hot water, we are not only saving energy and money, but also saving our clothes. Hot water machine washes on coloured laundry has a tendency to shrink, fade and wrinkle our clothes. As a rule, it might be worth washing whites or stained laundry in hot water, but wash everything else using a cold water setting on your washing machine. How convenient it is to throw a stained garment straight into the laundry basket, however it may be more efficient to spot clean that stain in the laundry sink, with a bit of elbow grease and stain remover. Shop bought stain removers include Sard Wonder Soap or Vanish, although bicarb soda mixed with a few drops of water might work just as well, rubbed into stains and left overnight before washing out. Hand washing the occasional worn and unstained garment in the laundry sink won't do any harm either. Consider filling the sink and washing a few pieces with soap and water, you'll be using less energy, and less water by doing so. On the market to buy a new washing machine? If you can afford to, it may be wise to choose a front-load washing machine, although they can be more expensive than the ol' top-loader. While a top-loading machine requires enough water to cover all the clothes in its drum, a front-loading washer needs only a third of that amount because its drum is set horizontally in the machine *housewares.about.com. When shopping for laundry detergent, try to look out for earth friendly laundry detergents, which exclude any harmful chemicals in favour of natural cleaning agents and essential oils. Moving away from chemically enhanced laundry detergents will not only be kinder to your clothes, but better for your skin, and the environment too. An article written on the potentially harmful toxins found in laundry detergent can be found here. 5. 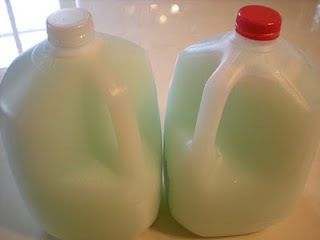 Ditch your laundry detergent! Have you considered ditching shop purchased detergent altogether? There is a great homemade detergent 'recipe' found on Why Not Sew? blog here, which costs an estimated $6.00 for 576 loads. Alternatively, bicarb soda, vinegar, and a cap full of eucalyptus essential oil with each wash can work just as well, treating stubborn stains by spot cleaning. An average drying-machine cycle uses just over 4kWh of energy and produces around 1.8kg CO2. If all households with a tumble dryer dried one load of washing outside each week, instead of by machine, they would save over a million tonnes of CO2 in a year *UK stats 2008 c/o guardian.co.uk. 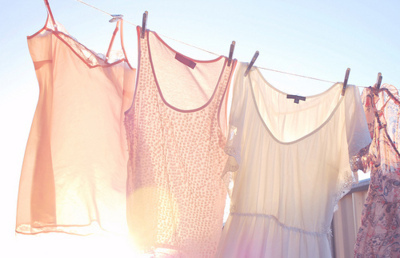 Outside washing lines and balconies are a great way to get your clothes dried by natural sunlight. Sunlight can also help to kill bacteria, which is particularly beneficial for cold water washes. It is worth noting however, that sunlight can cause fading in coloured garments, so either line dry colours in the shade, or inside out if in direct sunlight. Not the right weather or space for outside drying? No problem, hang clothes on an inside rack in a ventilated space, or some say hanging clothes in the bathroom, over the shower dries them quickly? Spin cycle's are great for bed sheets and linen, however, they can be a little rough on dedicates and cause twisting and wrinkling in some clothing pieces. On warmer days, it may be beneficial to take out clothes before the spin cycle altogether, or reduce the amount of time the cycle continues, give them a bit of a shake, and hang straight on the outside line. This may also reduce ironing time, as garments are not twisted too much before drying out. Canadian College student Josh Le undertook an experiment. He purchased a pair of untreated denim jeans by Nudie brand for $165, and wore them 330 times without washing between September of 2009 and December of 2010. The 20-year-old student carried around paper towels to dab out stains. If the jeans smelled, he might stick them in the freezer overnight or let them hang for a few hours. Le's jeans were then swabbed and tested for bacteria, enlisting the help of his professor, Rachel McQueen.. "There did not appear to be differences in the bacterial carriage depending on whether the jeans had been worn for 15 months or only 13 days," McQueen's findings read. Dry cleaning uses a chemical solvent rather than water on textiles. Most dry cleaners use a chemical called perchloroethylene which has been known to cause potentially nasty side effects. More here. Of course dry cleaning bills are expensive too. Check the washing instructions on a garment before you buy it. If a garment label reads "dry clean only," it might be worth questioning whether it would be worth buying or not. 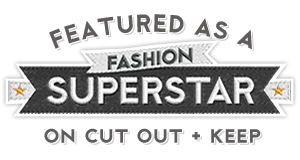 5 eco-friendly alternatives to dry cleaning can be found here. Melbourne (South East) thrifters are lucky, as we can buy lemons at 10c each from most local op shops! Do you have any green laundry tips to share? I am very happy with the washing mix I use - 1/2 the recommended dose of my eco-friendly (no phosphate, garden safe, biodegradable, non-poisonous) washing detergent (in this case 2 Tbls) with 1 Tbls of bicarb, and 1 Tbls of vinegar in the rinse. This is a Shannon Lush (Aussie cleaning, restoring & preservation guru) recipe. Front loader, cold wash, medium cycle, line dry. One question - lemons at 10c from op-shops? Please tell me where! Ravs - thank you for sharing your Shannon Lush recipe!! Perhaps I am too quick to assume all Australian op shops sell lemons for 10c... pop down to SE Suburbs in Melbourne, and I'll show you were they are! Thank you for this fantastic post, Erica, and this excellent advice!! I agree wholeheartedly with everything you have written here... my only very minor addition would be to say; plant your own lemon tree. Then your lemons will be free and available to you year-round! Here's to saving our precious water! The lemon juice is a great tip. My aunt and I were just talking about how ineffective bleach seems to be. I use soap nuts (www.inasoapnutshell.com) to wash with instead of any detergent, no nasty chemicals, optical brighteners or perfume. They are brilliant, I even used them to wash the the real nappies with when my pair were in nappies! Must go get myself some lemons, Big E's school shirts are looking a bit grey already! 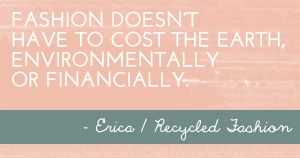 Great info Erica! I'm bookmarking this. I used to think front loaders would be the more eco-friendly option. We had a top loader for years, but when we moved, the place we moved into came with a front loader washer/dryer so we donated our old top loader to my brother. I have to say I *hate* my front loader. I've been washing in cold water for years, but the front loader we've got only allows you to select cold water on the "Wool", "Delicates" and "Hand wash" programs, which fill to the maximum level. If I want it to auto-detect the load and only use as much water as there is load for, I have to select at least 30deg water. It also does not wash as effectively. A cold water wash with a small amount of eco detergent used to clean my clothes fine in my old top loader, but the same load with the same detergent on a cold water cycle in the front loader leaves clothes still dirty. I find I have to wash now on the "Synthetic 30deg" wash program (which is slightly less aggressive than the "Cotton" program) in order to ensure I get clean clothes at the end. Checking our old water logs, we used LESS water per load in our old top loader than we do with the new front loader, simply because the front loader has too many pre-programmed settings that seem to be geared towards washing with the most water at the highest temperature (seriously, who needs to wash anything at 90deg?). I'm also boggled by the "Eco wash" setting. It's 60deg, so it's obviously not the water temp that's Eco. It adds almost an extra hour to wash time, so perhaps it uses less water and just tosses them around more. But when we checked the water usage, it came out the same as a regular wash. The manual has no explanation as to what is different about the "eco" setting compared to other settings. And never buy a combined washer dryer. We decided to test the dryer function on ours and my partner dutifully remembered to make sure the vent at the back lined up with the vent in the wall. There is no vent! Basically, from what we can tell, it simply cooks your clothes until the are dry. It took 5 hours to dry a single sheet! Definitely not an eco-friendly option. Moral of the story - look for a washing machine where you have good control over the settings to wash the way you want to wash. I would love to have my old top loader back as I could manually adjust the water level, agitation level, water temp, wash duration, and spin duration. Ant Queen - thank you so much for your input, all very valid points. If a front-loader does not have adequate settings, then an eco-machine it is not! I traveled through Asia for 8 months with only 2 pairs of jeans, a few t-shirts and 2 sets of underwear. I would do laundry every night, when I took my shower. It became such a habit that, 2 years later, I'm still doing most of my laundry while in the shower. My clothes also stay beautiful that way. I use the washing machine twice a month tops, only for bedding, towels and jeans. I am a HUGE Borax fan. I use it for everything. 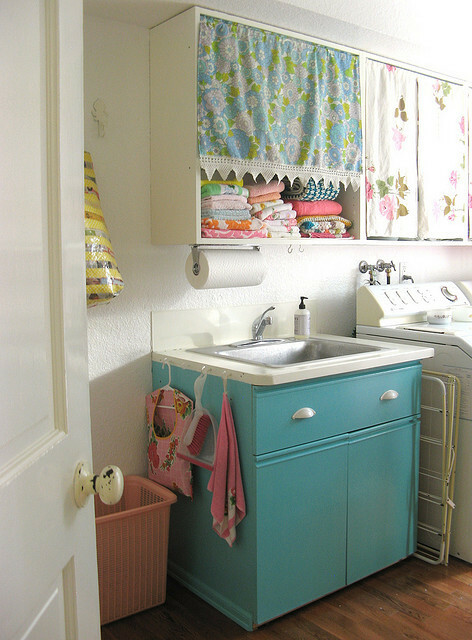 I've used "hippy" detergents (laundry, dishes) for over a decade, but Borax is the bomb...it scrubs my tub (baking soda & white vinegar are great, too), toilet, laundry, even soak my "dry clean only" sweaters in it. Been thinking about this a lot lately, and was planning on doing a little post as well. What a great post! I encourage my kids not to put clothes worn only once (let's face it: possibly only 5 minutes!) into their washing basket but if my clothes pass the smell and stain test they're always worn multiple times and until they're threadbare. Okay: I'm an extremist. I've recently been getting into some natural stain remedies partly because I just haven't been able to move a number of stains and needed help. The shop bought stuff is comparatively pathetic. Great advice, I am trying to encourage my daughter to wear outer clothes more than once if they're clean and smell OK. Do the sniff test LOL! Sometimes I think it's just laziness, easier to throw in the washing than than clothes up. I also made that homemade laundry detergent, and it is working out great! Thanks for putting me onto it, Erica! I use laundry balls for most of my washing - I have a front loader and as there's no soap/conditioner, this means I can then cut out the rinse cycle and switch the machine straight to final spin when it finishes the wash cycle - reduces water and electricity use, plus less wear on the clothes. I use soap powder for very few loads, but if I am using it, I put in just a fraction of the amount it tells me to on the box. I have only a couple of dry-clean only items - so far they have survived gentle handwashings!